Hydrangea petals are fading in color and tips are drying. Plants are in good sun/shade mix and are watered daily. What is the cause and the cure for this condition? This is the first summer this has happened, and typically the petals retain their freshness and deep color well into September. Thank you for your help. Judging from the symptoms, I would blame underwatering. 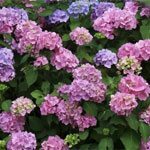 I know you said that they get watered daily and are in a good mix of sun/shade, but if you are having an unusually hot summer or if the hydrangea is getting more sun than in the past, this can cause problems. Sun amount can change if trees or buildings around the plant get larger or are removed. Even the water needs of the plant can change as it gets larger, which means what may have been enough water a few years ago is just too little now. Try increasing the water. You may also have a root issue that is preventing the plant from taking up enough water. It may be mild root rot or bugs. Check the roots and make sure they are healthy. The plant may also be having trouble taking up enough nutrients, so you may want to fertilize as well if you have not done so this year yet. Make sure you water well before you fertilize to keep from burning the roots.